While working on a DC motor controller project I needed to decode quadrature encoder signals. Basically a quadrature encoder has two signal lines, A and B. 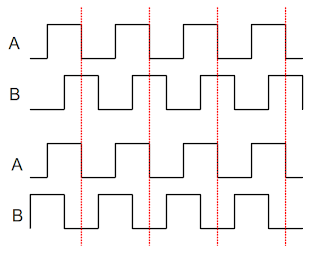 Rotational direction of the encoder can be determined by the phase difference between these signals. 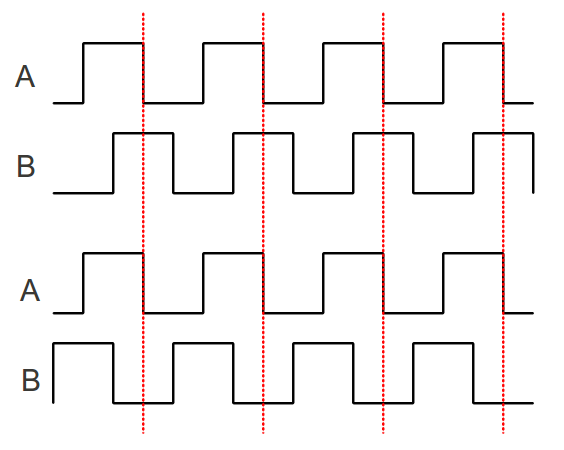 A simple way to detect the phase difference of the signals with the ATMEGA168 is to generate an interrupt on the falling edge of signal A and look at the value of signal B. If signal B is high of the falling edge of signal A the encoder is turning one way. And if signal B is low on the falling edge of signal A the encoder is turning the other way. The two signal lines from my encoder are connected to PD2 and PD3, Pins 4 and 5 on the ATMEGA168. These pins need to be set as input in The Port D Data Direction Register, DDRD, and their internal pullups need to be enabled in the The Port D Data Register, PORTD. I want the interrupt to trigger on the falling edge of encoder signal A. External Interrupt Control Register A , EICRA, is used to set the external interrupt sense control. Lastly the external interrupt needs to be enabled. This is done in the External Interrupt Mask Register, EIMSK.